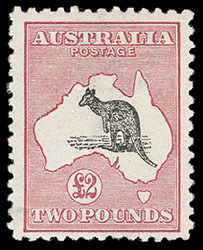 Australia, 1913, Kangaroo and Map, £2 black & rose, 1st watermark, o.g., lightly hinged, a fresh and attractive stamp with great color, F.-V.F. SG No. 16. 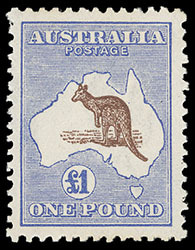 Australia, 1917, Kangaroo and Map, £1 chestnut & bright blue, 3rd watermark, o.g., hinge remnant (light gum toning at bottom), still an exceptionally well centered stamp with fresh, deep color, Very Fine. SG No. 44a. Australia, 1928, 3d Kookaburra miniature sheet, complete sheet of 15 panes of 4, brownish o.g., rich color and remarkably intact, vertical fold, F.-V.F. SG No. MS106a. Scott No. 95a $2,625 for hinged. 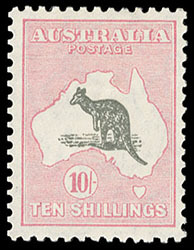 Australia, 1929, Kangaroo and Map, 10s gray & pink, Small Multiple watermark, o.g., lightly hinged, strong vivid colors, very fresh, Very Fine. SG No. 112. 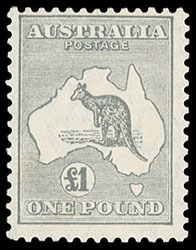 Australia, 1935, Kangaroo and Map, £1 gray, C of A watermark, o.g., lightly hinged, fresh with strong color, F.-V.F. SG No. 137. Australia, 1946, King George VI, 1½d green on 2½d red revalued entire, 1½ indicia with 6 bar overprint (type 1), on windowed entire with safety print inside and "B. Addison Pty. Ltd." corner card, canceled by neat "Sydney, Nov 10, 1946" slogan machine cancel; few minor edge nicks at lower right, Very Fine (Brusden-White #ES80, 2017 catalog AU$5,000). 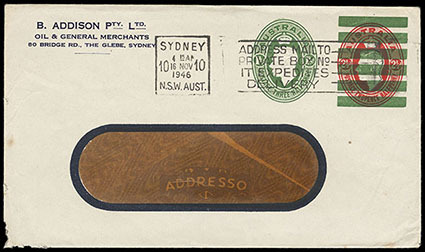 ONE OF FIVE KNOWN EXAMPLES OF THE 1946 KGV 1½D ON 2½D REVALUED ENTIRE - ONE OF THE MOSTLY HIGHLY SOUGHT AFTER ITEMS IN AUSTRALIAN PRINTED TO PRIVATE ORDER POSTAL STATIONERY. The 2017 Brusden-White lists only four examples of this entire, all used between November and December of 1946, with this example being a new discovery. 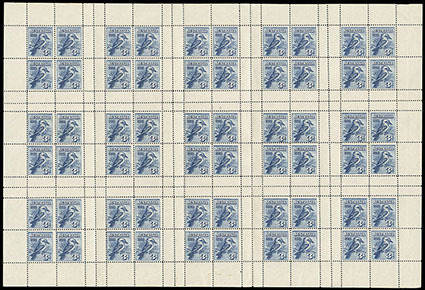 The revalue printing was done at the Note Printing Branch in Melbourne with the 1½d die and bars printed at the same time. The revaluing of this entire was for the printed matter rate within Australia & New Zealand. 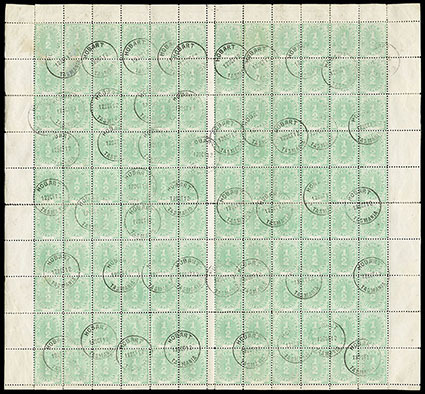 Australia, Postage Dues, 1902-04, ½d-20s, Madagascar "Specimen" overprint sheet, two sheets bearing 44 first and second issue postage due issues; includes first issue ½d-8d x3 with vertical serifed overprint, second issue 5d, 1s-2s x3 with vertical serifed overprint and set of 14 of the second issue with sans-serifed horizontal overprint, all with red Madagascar circular cachet handstamp, also includes N.S.W. 9d specimen on first page, each page sign by the director of poste et telegraphes, Very Fine, a wonderful intact pair of specimen sheets. SG No. D1s/7s, D22s//D44s Estimate $1,500 - 2,000. 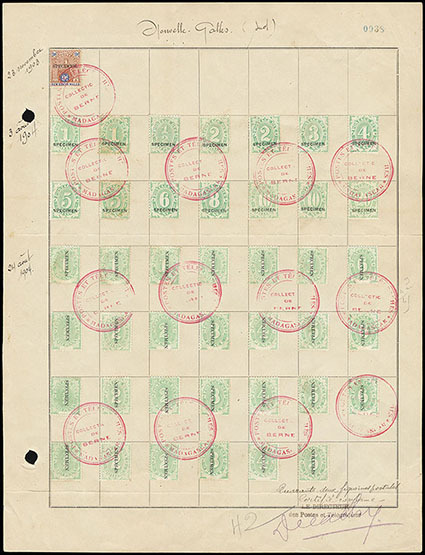 Australia, Postage Due, 1902-38, ½d-1½d sheet balance, group of 8 complete sheets; mint including S.G. D92, D93 x3 (each with different printer imprint) & D112, used S.G. D1 (showing various constant plate flaws), D64 & D106, mostly intact with full selvage, D92 vertically separated; few flaws, F.-V.F., a scarce group of sheets. SG No. D1//D112 £3,150 ($4,140). 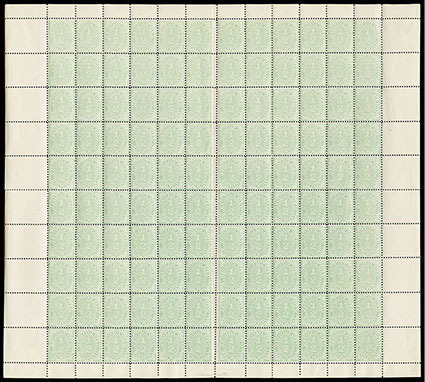 Australia, Postage Due, 1907, ½d dull green, perf 11½x11, complete sheet of 120, o.g., mostly never hinged, full intact selvage with only minor perf separations, Very Fine, a premium intact sheet from the 1907 "Emergency" printing. Scott No. J29. SG No. D53 £4,200 ($5,520). Barbados, 1878, "Britannia", 1d on half of 5s dull mauve, straight serif on "1", right half of stamp with surcharge reading upwards (surcharge type 3b), faintly canceled, strong color, Very Fine; with 2017 R.P.S.L. certificate. Scott No. 58. SG No. 87 £950 ($1,250).